I’ve been feeling a little stuck and overwhelmed thinking about all I need to do in the next couple of weeks, but some progress is still being made. As Stephanie and I were discussing yesterday, slow and steady wins the race, so that’s what I’m focusing on right now. 1. Quilt for my niece: done! Isn’t that spiral quilting fun? I love all the movement in this! I read several tutorials (best one here) about spiral quilting, then ignored most of what they told me to do. I used a regular presser foot, regular thread (white on top, turquoise on bottom), and kept the left edge of the presser foot 1/4″-3/8″ from the last line of stitching. The key thing is to draw the start of the spiral, sew very slowly around it, then go from there. I don’t think I quite realized how dense the quilting would be, though, so it took a LOT longer than I anticipated. A bit boring, frankly, but not hard at all. Right now, this is my favorite of all the quilts I’ve made, but I tend to say that about everything. 😉 This will go out in the mail to my niece tomorrow, and I hope she loves it. 2. Black hoodie: cut out and waiting. 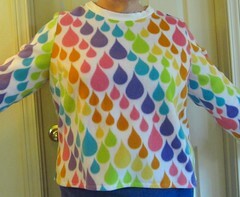 You know I love you, Marcy Tilton, but 12 pattern pieces for a hoodie? Seriously? 3. Sew-along dress: Getting there. 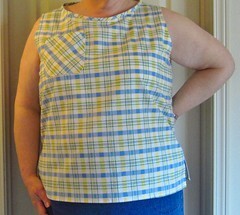 The pleats at the shoulders are just because those seams up there are only pinned. I was grumpy about it, so I’ve set it aside to work on next week, which is appropriate as it will be the bodice week of the sew-along. I’ll tackle the peek-a-boo problem with the back keyhole then. The good news is, though, that I went back and looked at those shoulder seams I had hastily pinned and realized my seam allowance was too narrow. When I corrected that, it was just enough to hide the bra on the sides. So that’s one less problem I have to deal with. 3. 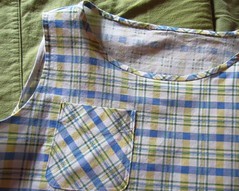 Pant hems and pockets–one set of pockets done, will finish second today. You’ll recall these are the RTW pants I bought that had fake pockets and needed hemming. I went looking for a tutorial on how to turn fake pockets into real ones, but was surprised to find there isn’t much out there (where are my fellow pocket people??) I started with this very basic one, but then tried to improve on it. I’ll see if I can’t get some better pictures and write up a quickie tutorial. It’s not pretty, but I was determined to not have to disassemble these pants to get those pockets in. Also–and I will have to try them on again and confirm this because I hardly believe it myself–the pants appear to have shrunk a solid 3-4 inches in length in the wash. And not at all in width! I may actually be able to wear pants that I don’t have to hem. Independence Day miracle? Sign of the apocalypse? Who knows, but less hemming is a good thing. 4. Mondrian-inspired cycling jersey for my honey–better than expected! The company I ordered the fabric from is supposed to be closed until 7/10, but I received notification yesterday that the fabric had shipped. Current tracking predicts Wednesday delivery, which would give me a week and a half to sew the jersey before we leave for London. I can do that. 5. Navy blouse–probably won’t happen, and that’s okay. Okay, so my new goal is to get those pants and the hoodie done by early next week, then fix the dress and start on the jersey. Have a great Thursday and, because I don’t say it enough, thank you so much for stopping by and reading about all my fretting, list-making, obsessions, and general goofiness. I appreciate your company (and your comments) so very much!